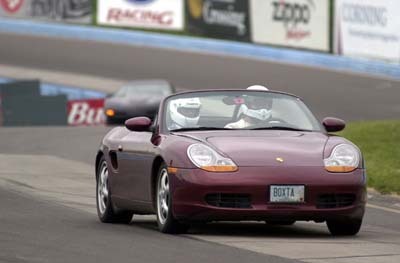 Here are some pictures of my car from the event at Watkins Glen. Click on the picture for a larger version, click on the larger version for a very high-res version. Warning, files are large and may take a while to download! This is my car outside the garage the first day. Despite appearances (and weather forecasts) we had almost no rain during the three days we were there. 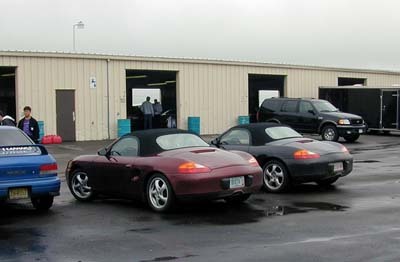 The car to the right is a 2001 S owned by Kevin Ilsen. Kevin was driving very well but unfortunately had an incident on the second day. He walked away from it unscathed though, as did his passenger (our own Todd Serota). His car wasn't so lucky. It will be a while before he gets it back, but he's anxious to get back on the track with it. Kevin is just one of the great people I met at the event, and he happens to live within a half hour of me. I'm trying to get Kevin to join the North Country Region of the Porsche Club of America, home of such enlightened individuals as myself, Dunkle, Jen Munson and Yellen. Kevin, if you see this send me an email, I'd like to get you to an NCR function so you can check it out. The car on the left is one of several very fast turbocharged Subarus that showed up at the event. They were a group of guys from Mass and NH who belong to a Subaru club, and some of the cars were very heavily modified. In addition to track days, they also like to attend the Team O'Neil Rally School in northern NH. I'm making plans to go with them the next time they head up there. This is my car in the "toe of the boot" on the first day. The toe is a nearly 180 degree righthander leading to a short uphill straight. 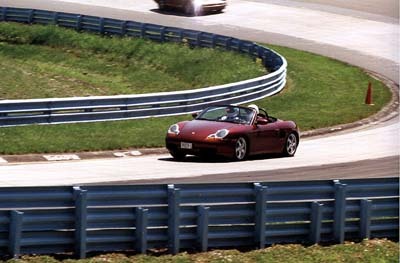 This turn really made the street tires (Michelin Pilot SX MXX3) on my Boxster talk! Even with the relatively low power and great balance of the Boxster, I could feel the rear end drifting just a tad in this turn. Not in a bad way, it actually helped get me through the turn quicker. This is a professional shot taken by TrakCam Productions, who were on hand to photograph the event. I got an 8x10 of this pic and the next one, as well as jpg versions of both. This shot was taken on the first day in the middle of the Esses. I'm not sure if this was the first or second session. I quickly found out that the Esses could and should be taken at WOT. The Esses lead directly onto the backstraight, and they are an absolute blast! The climb through the Esses coupled with the backstraight is the highest speed section of the track. I went from a terminal speed on the backstraight of ~95mph at the start to ~106mph by the end of the first day. I eventually hit as much as 116mph on the backstraight, but that's nothing compared to some of the cars. Rick Betterly hit 140mph in his '84 Carrera coupe and Mark Dalen was hitting 160+ in his modified 993TT. Note the black C5 in the background driven by Paul Sutherland. Believe it or not, Paul waved me by on the front straight just a little prior to this. Yes, the Boxta is actually pulling away from a C5! That's Fred again in the passenger seat. This is my favorite shot of the event. This pic was taken on the second day in Turn 9, a decreasing radius, off camber lefthander. Note that the NASCAR boys don't take this turn (or any others that are part of "The Boot"). This is a tricky turn, and like most of the Glen there's no room for error here. Because it's tricky, It's a fun one to get right. The car is taking this corner almost completely flat, which is a huge credit to the suspension. This corner works the car pretty hard, and most of the pics I saw showed a lot of compression in this turn. People aren't kidding when they say that suspension changes make the most difference when it's time to modify your car. The car in the background is a 2001 BMW 740i of all things, driven by Herb Wise. It wallowed in the turns, but Herb was hustling that thing along. Dunkle would have you believe that it was due to his instruction, but I should point out that the other car he was instructing in only managed to finish one lap on Day 1. Not that I'm saying Dunkle was bad luck or anything. This is a map of the track showing the all the turns, as well as the location of the garage. As you can see it's a well laid out track, with a nice mix of turns and straights. Running the full track, including "The Boot" gives you a 3.45 mile long track. The NASCAR racers bypass The Boot, leaving them with a much less challenging 2.45 mile configuraton. This is an elevation map showing the dramatic up and downhill sections of the track. The climb through the Esses and run down the backstraight make up the most exhilirating part of the track. You can find more information about TracQuest and Rennlist at their respective website. In addition, there are writeups by others of the Watkins Glen event, as well as more pictures available at the Rennlist main site. 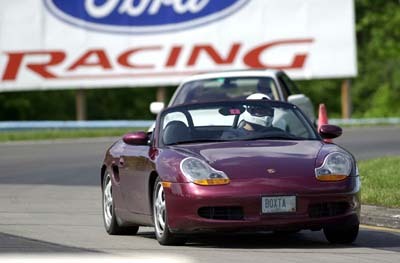 Additionally, Rennlist now has a dedicated Boxster discussion board! Click here to check out the best car enthusiast community online!  The official Watkins Glen site can be found here.